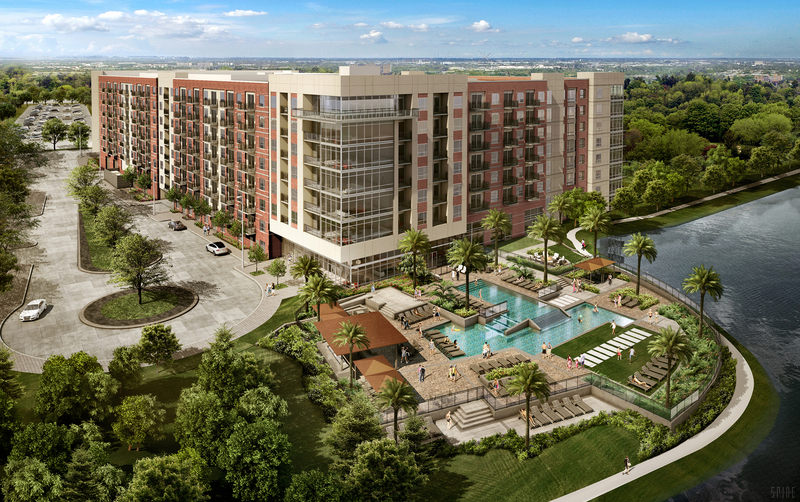 Rendering of Hughes Landing multifamily in The Woodlands. THE WOODLANDS – (Realty News Report) – Howard Hughes Corp. is starting construction on another multifamily project – the second apartment project the developer has announced in the last two months. Howard Hughes Corp. will build an 8-story, 386-unit apartment building in the Hughes Landing section of The Woodlands, a 28,000-acre community 27 miles north of Houston. Last month Howard Hughes started a 312-unit multifamily development in Bridgeland, an 11,000-acre master planned community on the northwest side of Houston near the Grand Parkway. The Hughes Landing multifamily project in The Woodlands is scheduled for completion in spring 2020. Preston Partnership is the architect and Hoar Construction is the construction manager. About three years ago, another Hughes multifamily complex was built in the Hughes Landing section of The Woodlands.